Toyotomi Hideyoshi hosts a great number of warlords and their wives at Osaka Castle for a grand feast to view the cherry blossoms. A dance by Ishida Mitsunari begins following a sword dance by all of the Seven Spearmen who surround Hideyoshi. When the ladies and their attendants who are present are all staring enchanted at Mitsunari's graceful dance moves, information arrives that suddenly transforms the atmosphere - Hideyoshi's concubine, Chacha, has just given birth to a baby boy. Hideyoshi is ecstatic, while Mitsunari watches him with a troubled expression. It is the summer of the 10th year of the Tensho Era (1582), and Oda Nobunaga suffers an unnatural death at Honnoji Temple. On the grounds outside Kiyosu Castle, Chacha is in shock over the sudden passing of her uncle Nobunaga. She brandishes a whip at a group of the people of the fiefdom, who had just been celebrating an abundant harvest in spite of the death of the feudal lord. 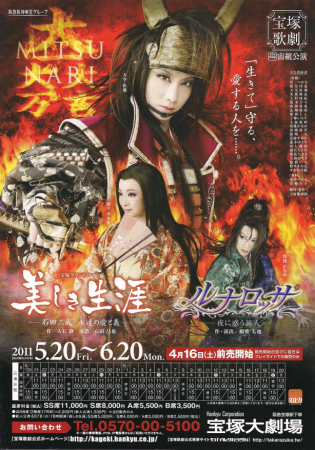 But her hand is restrained by Mitsunari, one of Hideyoshi's vassals, who is passing through the area. He admonishes her to sympathize with the people and have more respect for human life. Coincidentally, Mitsunari and Chacha were both born in the region of Omi. From today's first encounter onward, the pair will feel a special something toward each other. Chacha's mother Ichi hears about what has been happening between Mitsunari and Chacha from Hayate, a ninja from Koga. Hideyoshi has a notion to make the beautiful Ichi his own, even though she detests him. So Ichi decides to take her daughters with her to Shibata Katsuie with an eye to marriage. It is winter of the following year, Tensho 11. Shibata's castle, Kitanosho, is surrounded by the forces of Hideyoshi and about to fall. Hayate is entrusted by Ichi, who is resigned to die, to take care of the daughters. There is great confusion inside the castle, where the forces of Shibata and Hideyoshi clash amid raging fire. In such a place, Chacha and Mitsunari, who is leading Hideyoshi's army, are reunited. Mitsunari asks Chacha, who hates the thought of coming under the care of Hideyoshi and is hoping to follow in her mother's footsteps in death, to put her life in his hands. Guided by Hayate, the couple somehow make it out of the castle before the flames rise up and the castle tower collapses. Chacha hides herself in a barn. After regaining her composure, she asks Mitsunari about the origin of his name, which literally means "three things that should be constructed." The first thing, he explains, is to become a cornerstone of the efforts of his master Hideyoshi to unify the country. The second is to be concerned with allowing the people to lead affluent lives. And the third - to keep Chacha alive. She informs Mitsunari that she wants him to do something someday to make her feel happy that she is alive. Chacha leads a tranquil life as she is watched over by Mitsunari alongside Lake Biwa, where she grew up. She entertains thoughts of Mitsunari during this period. Mitsunari also becomes aware of his own heart's affection for Chacha. But Mitsunari, a man of extreme loyalty, is forced to suppress his affections due to a difference in social status between the two, as she is descended from Nobunaga and he is the son of a local clan. It is the 13th year of Tensho, and Osaka Castle has been completed. The group leaves to a new opulent castle. Everyone is in lively spirits. However, Chacha feels lonely as she will have to wait longer to see Mitsunari, for he is busy working as the right-hand man for Hideyoshi's attempt to unify the country. On one occasion, Mitsunari hears an unexpected remark by Hideyoshi, who orders him to bring Chacha to the castle that evening. Hideyoshi is considering taking the beautiful Chacha, who resembles Ichi, as a concubine. This would be the pairing of Hideyoshi and Chacha - Mitsunari is in a deep quandary over love and loyalty. Luna Rossa means "red moon". Under a red moon, various images unfold in this exotic and enchanting revue. The worlds of the Near and Middle East, where the cultures of the East and West intermingle, are developed for the stage. Ouki Kaname's first performance with Cosmos Troupe. Final performance for Amaki Tonika and Nanase Ririko. Himiya Sakura was originally meant to retire in this performance, but with the re-scheduling of the Nippon Seinenkan run of Valentino, that became her official last performance. Created by lokai. Last Modification: Saturday 24 of November, 2018 18:54:00 PST by lokai.